A personalized license plate is an excellent way to add a little bit of unique flair to your vehicle. With a personalized plate, you can say something about yourself through your car and show off some of your personality. In Montana, your license plate can be personalized in two ways. You can choose a license plate design that suits your style and interest (Montana has some of the most intricate and artistic license plate designs in the country), and you can add a custom license plate message, which can be used to support a loved one or an alma mater, among other things. Ordering a personalized plate is straightforward and doesn’t take long, so if you’ve been looking for a way to customize your vehicle, a personalized Montana license plate may be perfect for you. Step 1: Go to Montana’s license plate page. Visit the Montana Motor Vehicle Division license plate website. Step 2: Select a design for your personalized license plate. Click on the button that says “License plate designs” and choose a plate theme from the numerous available choices. Once you find the license plate design that you like the most, write down the name of it. Note: Different license plate designs have different fees. Be sure to look under the plate description to see how much money the plate you are choosing will cost. If you would like to avoid this fee, you can get a personalized plate message on a standard license plate, and then you will only have to pay the personalization fee. Tip: Each license plate description features a section explaining what the fee money is used to benefit. Be sure to read these descriptions if you are interested in helping out a good cause. Print the application; or, if you prefer, fill it out on your computer and then print it. Step 2: Fill out your basic information at the top of the form. You will need to accurately provide your name, or the name of your business, as well as your address, phone number, and a form of identification. Note: The vehicle for which you are getting personalized plates must be registered to you. You will not be allowed to order a plate if you are not the owner of the car. Step 3: Provide your vehicle’s information on the form. You will need to provide the year, make, model, style, and color of your car, as well as the vehicle identification number. Tip: If you do not know your vehicle identification number, it can be found on the driver’s side of the dash, where the dash meets the windshield. The number can be viewed from outside the vehicle, through the windshield. Find the license plate theme that you chose to see how many characters your plate message can be. Return to the first page of the form, and compose a message in the space titled “Choice 1,” then backup options in the spaces titled “Choice 2” and “Choice 3.” The Motor Vehicle Division will prioritize your messages based on the choice order; for example, if your first choice is taken, you will be given your second choice, if available. Write down the meaning for each license plate message choice. This is required, and helps the Motor Vehicle Division deem whether or not your plate message is appropriate. Tip: Your license plate message can contain numbers, letters, and spaces, but must have at least one letter, and at least two characters, not including spaces. You cannot use any other form of punctuation. The letter “O” and the number “0” are interchangeable, and you cannot use a space at the beginning or the end of the message. Warning: Crude, vulgar, or offensive plate messages will be rejected. Step 5: Sign and date the personalized license plate application. At the bottom of the first page, provide your printed name, as well as the date and your signature. Tip: After completing the application, review all of the information and make sure that it is accurate, and that there are no spelling errors. Step 1: Take the application to a county treasurer’s office. Find your local county treasurer’s office and take your personalized license plate application form there. Tell a clerk that you are there for a personalized license plate, and hand them the form. Step 2: Pay the personalized license plate fees. You will owe a fee for the personalized license plate, in addition to the fees for the license plate design that you chose. These fees do not include standard and preexisting license plate and registration fees and taxes. Tip: All county treasurer offices take checks and money orders as payment. If you would like to see if your office will take your credit card, simply call them before going in. Warning: The personalized plate fee is nonrefundable, even if your license plate messages are not available. Step 1: Receive your personalized license plates. After your application has been processed and accepted, your plates will be manufactured and sent to you at the mailing address listed on your application. Note: It can take up to three months for your plates to arrive, so don’t be concerned if you have to wait a while. Step 2: Install your personalized license plates. As soon as you get the plates, install them on both the front and back of your car. If you do not feel comfortable installing the license plates by yourself, you can stop by any garage or mechanic shop and have them installed. This is a good time to check your license plate light as well. If your license plate light is burned out, you need to hire a mechanic to come help you do the job. Warning: Be sure to place current registration stickers on your license plate before driving. 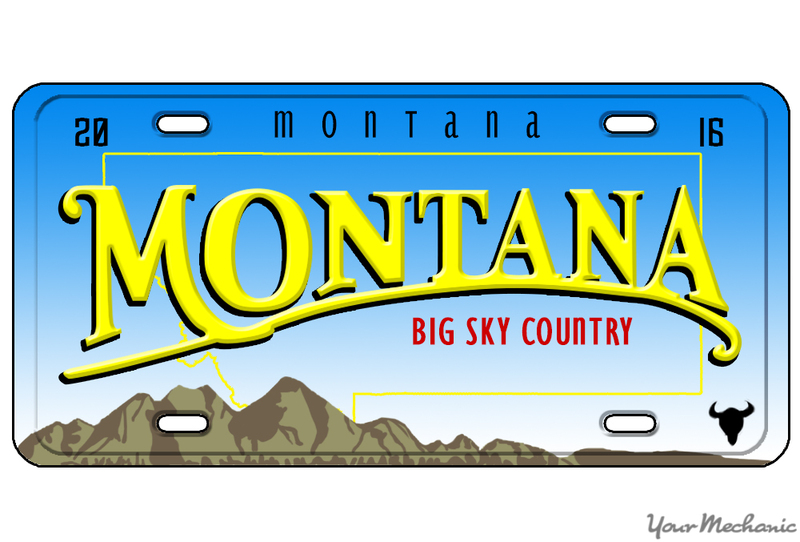 With a personalized Montana license plate, you’re sure to smile every time you get in your car. It’s a fun and easy way to add a little personalization and customization to your vehicle. Q: Is it illegal to have license plates as body work? Hi Salvador, this is an interesting question. I'm not sure if it's legal or not so your best bet is to contact the Missouri DMV and see what they say. Q: My 2004 Pontiac Montana won't start just clicks when I turn key but lights,radio still work & its a new battery. What could it be?